Polystyrene standard cone, choose your size. The polystyrene standard cone is perfect for all those who have a hobby for decoupage or do-it-yourself decorations. It is also widely used by those skilled in the art of cake design. Our company offers a large choice of sizes for polystyrene standard cone. Below you can select the measure that best meets your needs. The standard cone in polystyrene is a shape to decorate, perfect both in the art of cake design for cakes dummies, both in the decoupage, to achieve fantastic DIY decorations. 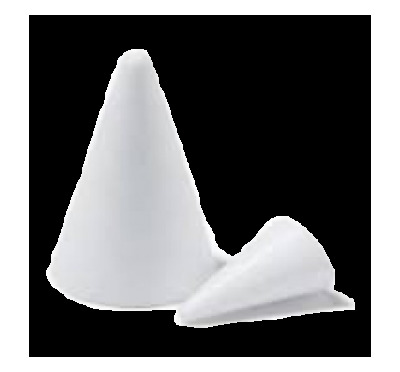 The standard cone in polystyrene for DIY, is used by all those who have the hobby of handmade decorations. The standard cone in polystyrene for do-it-yourself allows you to practice the art of decoupage and amateur decorations. The polystyrene standard cone for do-it-yourself can be coated in different ways depending on the circumstance in which you want to use. In fact, once coated with the vinyl glue on the polystyrene shape it is possible to cover the surface with glitter, paper for decoupage, sequins and even with some cover fabric. The polystyrene, with which the standard cone is made, in fact, allows an easy adherence of every type of material. Especially in recent times the polystyrene standard cone for DIY is used in many sectors, including that of cake design. In fact, polystyrene standard cones for do-it-yourself can also be coated with sugar paste or with fondant paste to create decorations to add to Christmas cakes. The polystyrene of which the standard cones are composed allows an easy adherence of the mixture to be used, with the aid of simple water. The standard cone is able to stimulate confectioners and cake design enthusiasts to create sculptural cakes decorated in an artistic and spectacular way. There are many ideas and tutorials you can find online to decorate a polystyrene round tip cone for Christmas decorations. Among the most used materials to decorate the polystyrene round tip cone there are glitter, sequins, fabric, twine or cotton and even pasta. With these materials, a little bit of glue and a lot of creativity you can make a round tip cone in polystyrene for custom Christmas decoration. In creating a Christmas decoration with polystyrene, in addition to the satisfaction of creating a decoration for your tree with your own hands, you can customize the polystyrene round tip cone for Christmas decorations according to your taste and your decorative needs. With the polystyrene round tip cone for Christmas decorations, you can use your imagination to embellish and decorate any environment. In fact, the polystyrene round tip cone for Christmas decorations is also very useful for decorating the windows of shops for Christmas holidays. Using a little bit of imagination this polystyrene round tip cone for Christmas decorations can also be an excellent gift idea for friends or relatives, or it can be sold in Christmas markets. They are very appreciated by everyone because they are handmade and personalized, and demonstrate the commitment, affection, ability and creativity of those who made them. 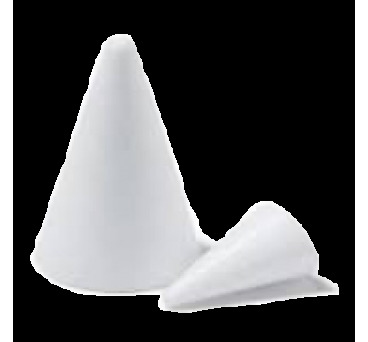 The polystyrene standard cone in variety of sizes is of excellent quality. Our company with years of experience in processing polystyrene and sophisticated hot wire machines for precise and accurate cutting offers a wide choice of sizes. Our catalogue of polystyrene standard cone in variety of sizes, in fact, allows you to choose standard cones of different sizes, to satisfy every need. You can choose standard cones with heights of 2.5 inches, 5 inches, 8 inches, 10 inches, 12 inches, 14.5 inches, 19.75 inches and 27.5 inches, and widths of 1.5 inches, 2.75 inches, 3.5 inches, 4 inches, 4.5 inches, 5.5 inches, 7 inches and 10 inches.